1 E None No Power Seat 1 E is a standard First Class seat. 1 F None No Power Seat 1 F is a standard First Class seat. 10 A None No Power Seat 10 A is a standard Business Class seat whose proximity to the galley and lavatories may be bothersome. 10 E None No Power Seat 10 E is a standard Business Class seat whose proximity to the galley and lavatories may be bothersome. 10 F None No Power Seat 10 F is a standard Business Class seat whose proximity to the galley and lavatories may be bothersome. 10 K None No Power Seat 10 K is a standard Business Class seat whose proximity to the galley and lavatories may be bothersome. 21 E None No Power Seat 21 E is a standard Business Class seat. 22 A None No Power Seat 22 A is a standard Business Class seat whose proximity to the lavatories may be bothersome. 22 E None No Power Seat 22 E is a standard Business Class seat whose proximity to the lavatories may be bothersome. 22 F None No Power Seat 22 F is a standard Business Class seat whose proximity to the lavatories may be bothersome. 22 K None No Power Seat 22 K is a standard Business Class seat whose proximity to the lavatories may be bothersome. 25 A None No Power Seat 25 A is a standard Economy Class seat that may have restricted legroom due to the position of the bulkhead. 25 B None No Power Seat 25 B is a standard Economy Class seat that may have restricted legroom due to the position of the bulkhead. 25 D None No Power Seat 25 D is a standard Economy Class seat that may have restricted legroom due to the position of the bulkhead. 25 E None No Power Seat 25 E is a standard Economy Class seat that may have restricted legroom due to the position of the bulkhead. 25 F None No Power Seat 25 F is a standard Economy Class seat that may have restricted legroom due to the position of the bulkhead. 25 G None No Power Seat 25 G is a standard Economy Class seat that may have restricted legroom due to the position of the bulkhead. 25 J None No Power Seat 25 J is a standard Economy Class seat that may have restricted legroom due to the position of the bulkhead. 25 K None No Power Seat 25 K is a standard Economy Class seat that may have restricted legroom due to the position of the bulkhead. 29 D None No Power Seat 29 D is a standard Economy Class seat that may have limited recline. 29 E None No Power Seat 29 E is a standard Economy Class seat that may have limited recline. 29 F None No Power Seat 29 F is a standard Economy Class seat that may have limited recline. 29 G None No Power Seat 29 G is a standard Economy Class seat that may have limited recline. 30 A None No Power Seat 30 A is a standard Economy Class exit row seat that has extra legroom. There is no storage for this seat during takeoff and landing. The tray tables are in the armrest, making the armrest immovable and slightly reducing seat width. 30 B None No Power Seat 30 B is a standard Economy Class exit row seat that has extra legroom. There is no storage for this seat during takeoff and landing. The tray tables are in the armrest, making the armrest immovable and slightly reducing seat width. 30 D None No Power Seat 30 D is a standard Economy Class exit row seat that has extra legroom. There is no storage for this seat during takeoff and landing. The tray tables are in the armrest, making the armrest immovable and slightly reducing seat width. 30 E None No Power Seat 30 E is a standard Economy Class exit row seat that has extra legroom. There is no storage for this seat during takeoff and landing. The tray tables are in the armrest, making the armrest immovable and slightly reducing seat width. 30 F None No Power Seat 30 F is a standard Economy Class exit row seat that has extra legroom. There is no storage for this seat during takeoff and landing. The tray tables are in the armrest, making the armrest immovable and slightly reducing seat width. 30 G None No Power Seat 30 G is a standard Economy Class exit row seat that has extra legroom. There is no storage for this seat during takeoff and landing. The tray tables are in the armrest, making the armrest immovable and slightly reducing seat width. 30 J None No Power Seat 30 J is a standard Economy Class exit row seat that has extra legroom. There is no storage for this seat during takeoff and landing. The tray tables are in the armrest, making the armrest immovable and slightly reducing seat width. 30 K None No Power Seat 30 K is a standard Economy Class exit row seat that has extra legroom. There is no storage for this seat during takeoff and landing. The tray tables are in the armrest, making the armrest immovable and slightly reducing seat width. 31 A None No Power Seat 31 A is a standard Economy Class seat in the last row of the upper deck. The proximity to the lavatories and galley may be bothersome. 31 B None No Power Seat 31 B is a standard Economy Class seat in the last row of the upper deck. The proximity to the lavatories and galley may be bothersome. 31 G None No Power Seat 31 G is a standard Economy Class seat whose proximity to the lavatories and galley may be bothersome. 31 J None No Power Seat 31 J is a standard Economy Class seat in the last row of the upper deck. The proximity to the lavatories and galley may be bothersome. 31 K None No Power Seat 31 K is a standard Economy Class seat in the last row of the upper deck. The proximity to the lavatories and galley may be bothersome. 32 D None No Power Seat 32 D is a standard Economy Class seat in the last row of the upper deck. The proximity to the lavatories and galley may be bothersome. 32 E None No Power Seat 32 E is a standard Economy Class seat in the last row of the upper deck. The proximity to the lavatories and galley may be bothersome. 32 F None No Power Seat 32 F is a standard Economy Class seat in the last row of the upper deck. The proximity to the lavatories and galley may be bothersome. 32 G None No Power Seat 32 G is a standard Economy Class seat in the last row of the upper deck. The proximity to the lavatories and galley may be bothersome. 40 A None No Power Seat 40 A is a standard Economy Class exit row seat with extra legroom however, the proximity to the lavatory and galley may be bothersome. 40 B None No Power Seat 40 B is a standard Economy Class exit row seat with extra legroom however, the proximity to the lavatory and galley may be bothersome. 40 C None No Power Seat 40 C is a standard Economy Class exit row seat with extra legroom however, the proximity to the lavatory and galley may be bothersome. 40 H None No Power Seat 40 H is a standard Economy Class exit row seat with extra legroom however, the proximity to the lavatory and galley may be bothersome. 40 J None No Power Seat 40 J is a standard Economy Class exit row seat with extra legroom however, the proximity to the lavatory and galley may be bothersome. 40 K None No Power Seat 40 K is a standard Economy Class exit row seat with extra legroom however, the proximity to the lavatory and galley may be bothersome. 43 D None No Power Seat 43 D is a standard Economy Class seat that may have restricted legroom due the position of the bulkhead. 43 E None No Power Seat 43 E is a standard Economy Class seat that may have restricted legroom due the position of the bulkhead. 43 F None No Power Seat 43 F is a standard Economy Class seat that may have restricted legroom due the position of the bulkhead. 43 G None No Power Seat 43 G is a standard Economy Class seat that may have restricted legroom due the position of the bulkhead. 48 D None No Power Seat 48 D is a standard Economy Class seat that may have limited recline. The proximity to the lavatories and galleys may be bothersome. 48 E None No Power Seat 48 E is a standard Economy Class seat that may have limited recline. The proximity to the lavatories and galleys may be bothersome. 48 F None No Power Seat 48 F is a standard Economy Class seat that may have limited recline. The proximity to the lavatories and galleys may be bothersome. 48 G None No Power Seat 48 G is a standard Economy Class seat that may have limited recline. The proximity to the lavatories and galleys may be bothersome. 49 A None No Power Seat 49 A is a standard Economy Class seat that may have limited recline. The proximity to the lavatories and galleys may be bothersome. 49 B None No Power Seat 49 B is a standard Economy Class seat that may have limited recline. The proximity to the lavatories and galleys may be bothersome. 49 C None No Power Seat 49 C is a standard Economy Class seat that may have limited recline. The proximity to the lavatories and galleys may be bothersome. 49 H None No Power Seat 49 H is a standard Economy Class seat that may have limited recline. The proximity to the lavatories and galleys may be bothersome. 49 J None No Power Seat 49 J is a standard Economy Class seat that may have limited recline. The proximity to the lavatories and galleys may be bothersome. 49 K None No Power Seat 49 K is a standard Economy Class seat that may have limited recline. The proximity to the lavatories and galleys may be bothersome. 50 A None No Power Seat 50 A is a standard Economy Class seat that may have restricted legroom due to the position of the bulkhead. The proximity to the galleys may be bothersome. 50 B None No Power Seat 50 B is a standard Economy Class seat that may have restricted legroom due to the position of the bulkhead. The proximity to the galleys may be bothersome. 50 C None No Power Seat 50 C is a standard Economy Class seat that may have restricted legroom due to the position of the bulkhead. The proximity to the galleys may be bothersome. 50 D None No Power Seat 50 D is a standard Economy Class seat that may have restricted legroom due to the position of the bulkhead. The proximity to the galleys may be bothersome. 50 E None No Power Seat 50 E is a standard Economy Class seat that may have restricted legroom due to the position of the bulkhead. The proximity to the galleys may be bothersome. 50 F None No Power Seat 50 F is a standard Economy Class seat that may have restricted legroom due to the position of the bulkhead. The proximity to the galleys may be bothersome. 50 G None No Power Seat 50 G is a standard Economy Class seat that may have restricted legroom due to the position of the bulkhead. The proximity to the galleys may be bothersome. 50 H None No Power Seat 50 H is a standard Economy Class seat that may have restricted legroom due to the position of the bulkhead. The proximity to the galleys may be bothersome. 50 J None No Power Seat 50 J is a standard Economy Class seat that may have restricted legroom due to the position of the bulkhead. The proximity to the galleys may be bothersome. 50 K None No Power Seat 50 K is a standard Economy Class seat that may have restricted legroom due to the position of the bulkhead. The proximity to the galleys may be bothersome. 61 D None No Power Seat 61 D is a standard Economy Class seat that may have limited recline. The proximity to the lavatories may be bothersome. 61 E None No Power Seat 61 E is a standard Economy Class seat that may have limited recline. The proximity to the lavatories may be bothersome. 61 F None No Power Seat 61 F is a standard Economy Class seat that may have limited recline. The proximity to the lavatories may be bothersome. 61 G None No Power Seat 61 G is a standard Economy Class seat that may have limited recline. The proximity to the lavatories may be bothersome. 62 A None No Power Seat 62 A is a standard Economy Class seat that may have limited recline. The proximity to the lavatories may be bothersome. 62 B None No Power Seat 62 B is a standard Economy Class seat that may have limited recline. The proximity to the lavatories may be bothersome. 62 C None No Power Seat 62 C is a standard Economy Class seat that may have limited recline. The proximity to the lavatories may be bothersome. 62 H None No Power Seat 62 H is a standard Economy Class seat that may have limited recline. The proximity to the lavatories may be bothersome. 62 J None No Power Seat 62 J is a standard Economy Class seat that may have limited recline. The proximity to the lavatories may be bothersome. 62 K None No Power Seat 62 K is a standard Economy Class seat that may have limited recline. The proximity to the lavatories may be bothersome. 63 A None No Power Seat 63 A is a standard Economy Class exit row seat that has extra legroom. The proximity to the lavatories may be bothersome. 63 B None No Power Seat 63 B is a standard Economy Class exit row seat that has extra legroom. The proximity to the lavatories may be bothersome. 63 C None No Power Seat 63 C is a standard Economy Class exit row seat that has extra legroom. The proximity to the lavatories may be bothersome. 63 D None No Power Seat 63 D is a standard Economy Class exit row seat that has extra legroom. The proximity to the lavatories may be bothersome. 63 E None No Power Seat 63 E is a standard Economy Class exit row seat that has extra legroom. The proximity to the lavatories may be bothersome. 63 F None No Power Seat 63 F is a standard Economy Class exit row seat that has extra legroom. The proximity to the lavatories may be bothersome. 63 G None No Power Seat 63 G is a standard Economy Class exit row seat that has extra legroom. The proximity to the lavatories may be bothersome. 63 H None No Power Seat 63 H is a standard Economy Class exit row seat that has extra legroom. The proximity to the lavatories may be bothersome. 63 J None No Power Seat 63 J is a standard Economy Class exit row seat that has extra legroom. The proximity to the lavatories may be bothersome. 63 K None No Power Seat 63 K is a standard Economy Class exit row seat that has extra legroom. The proximity to the lavatories may be bothersome. 68 D None No Power Seat 68 D is a standard Economy Class seat with additional legroom due to the missing seat in front. There is no floor storage for this seat during takeoff and landing. The tray table and video monitor is in the armrest, making the armrest immovable and slightly reducing seat width. 73 A None No Power Seat 73 A is a standard Economy Class seat that may have limited recline. The proximity to the galleys may be bothersome. 73 B None No Power Seat 73 B is a standard Economy Class seat that may have limited recline. The proximity to the galleys may be bothersome. 73 C None No Power Seat 73 C is a standard Economy Class seat that may have limited recline. The proximity to the galleys may be bothersome. 73 D None No Power Seat 73 D is a standard Economy Class seat however, the proximity to the galleys may be bothersome. 73 G None No Power Seat 73 G is a standard Economy Class seat however, the proximity to the galleys may be bothersome. 73 H None No Power Seat 73 H is a standard Economy Class seat that may have limited recline. The proximity to the galleys may be bothersome. 73 J None No Power Seat 73 J is a standard Economy Class seat that may have limited recline. The proximity to the galleys may be bothersome. 73 K None No Power Seat 73 K is a standard Economy Class seat that may have limited recline. The proximity to the galleys may be bothersome. 74 D None No Power Seat 74 D is a standard Economy Class seat that may have limited recline. The proximity to the galleys may be bothersome. 74 E None No Power Seat 74 E is a standard Economy Class seat that may have limited recline. The proximity to the galleys may be bothersome. 74 F None No Power Seat 74 F is a standard Economy Class seat that may have limited recline. The proximity to the galleys may be bothersome. 74 G None No Power Seat 74 G is a standard Economy Class seat that may have limited recline. The proximity to the galleys may be bothersome. 75 A None No Power Seat 75 A is a standard Economy Class exit row seat that has extra legroom. The proximity to the galleys may be bothersome. 75 B None No Power Seat 75 B is a standard Economy Class exit row seat that has extra legroom. The proximity to the galleys may be bothersome. 75 C None No Power Seat 75 C is a standard Economy Class exit row seat that has extra legroom. The proximity to the galleys may be bothersome. 75 H None No Power Seat 75 H is a standard Economy Class exit row seat that has extra legroom. The proximity to the galleys may be bothersome. 75 J None No Power Seat 75 J is a standard Economy Class exit row seat that has extra legroom. The proximity to the galleys may be bothersome. 75 K None No Power Seat 75 K is a standard Economy Class exit row seat that has extra legroom. The proximity to the galleys may be bothersome. 76 D None No Power Seat 76 D is a standard Economy Class seat that may have restricted legroom. The proximity to the galleys may be bothersome. 76 E None No Power Seat 76 E is a standard Economy Class seat that may have restricted legroom. The proximity to the galleys may be bothersome. 76 F None No Power Seat 76 F is a standard Economy Class seat that may have restricted legroom. The proximity to the galleys may be bothersome. 76 G None No Power Seat 76 G is a standard Economy Class seat that may have restricted legroom. The proximity to the galleys may be bothersome. 78 B None No Power Seat 78 B is a standard Economy Class seat. 78 J None No Power Seat 78 J is a standard Economy Class seat. 79 A None No Power Seat 79 A is a standard Economy Class seat. 79 B None No Power Seat 79 B is a standard Economy Class seat. 79 C None No Power Seat 79 C is a standard Economy Class seat. 79 D None No Power Seat 79 D is a standard Economy Class seat. 79 E None No Power Seat 79 E is a standard Economy Class seat. 79 F None No Power Seat 79 F is a standard Economy Class seat. 79 G None No Power Seat 79 G is a standard Economy Class seat. 79 H None No Power Seat 79 H is a standard Economy Class seat. 79 J None No Power Seat 79 J is a standard Economy Class seat. 79 K None No Power Seat 79 K is a standard Economy Class seat. 80 A None No Power Seat 80 A is a standard Economy Class seat. 80 B None No Power Seat 80 B is a standard Economy Class seat. 80 C None No Power Seat 80 C is a standard Economy Class seat. 80 H None No Power Seat 80 H is a standard Economy Class seat. 80 J None No Power Seat 80 J is a standard Economy Class seat. 80 K None No Power Seat 80 K is a standard Economy Class seat. 81 C None No Power Seat 81 C is a standard Economy Class seat. 81 H None No Power Seat 81 H is a standard Economy Class seat. 82 C None No Power Seat 82 C is a standard Economy Class seat however, the proximity to the lavatories may be bothersome. 82 D None No Power Seat 82 D is a standard Economy Class seat in the last row of the aircraft that may have limited recline. The proximity the lavatories may be bothersome. 82 E None No Power Seat 82 E is a standard Economy Class seat in the last row of the aircraft that may have limited recline. The proximity the lavatories may be bothersome. 82 F None No Power Seat 82 F is a standard Economy Class seat in the last row of the aircraft that may have limited recline. The proximity to the lavatories may be bothersome. 82 G None No Power Seat 82 G is a standard Economy Class seat in the last row of the aircraft that may have limited recline. The proximity the lavatories may be bothersome. 82 H None No Power Seat 82 H is a standard Economy Class seat however, the proximity to the lavatories may be bothersome. 83 A None No Power Seat 83 A is a standard Economy Class seat in the last row of the aircraft that may have limited recline. The proximity the lavatories may be bothersome. 83 B None No Power Seat 83 B is a standard Economy Class seat in the last row of the aircraft that may have limited recline. The proximity the lavatories may be bothersome. 83 C None No Power Seat 83 C is a standard Economy Class seat in the last row of the aircraft that may have limited recline. The proximity the lavatories may be bothersome. 83 H None No Power Seat 83 H is a standard Economy Class seat in the last row of the aircraft that may have limited recline. The proximity the lavatories may be bothersome. 83 J None No Power Seat 83 J is a standard Economy Class seat in the last row of the aircraft that may have limited recline. The proximity the lavatories may be bothersome. 83 K None No Power Seat 83 K is a standard Economy Class seat in the last row of the aircraft that may have limited recline. The proximity the lavatories may be bothersome. This Airbus A380 offers an AC power port at each seat across all cabins. This Airbus A380 is equipped with Wi-Fi that passengers can connect to during flight. This Airbus A380 seats 517 passengers and is primarily used on International routes. This aircraft features 8 First Class open suites, 48 flat bed Business Class seats, and 461 standard Economy seats. 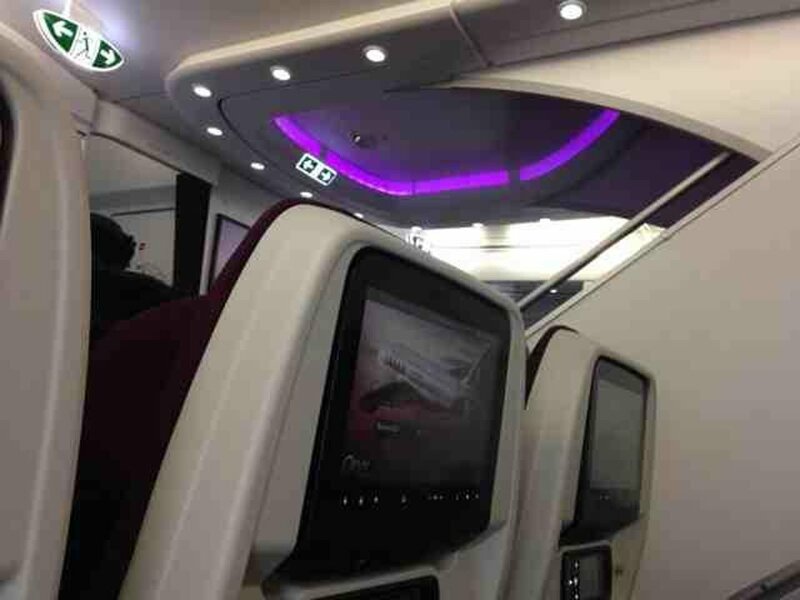 My wife and I flew from Doha to Perth in November 2018 in this amazing aircraft with its similarly amazing cabin crew. Its called business class but felt more like first class. It's a 12 hour flight, but so quiet, I slept for 8 of those in the most comfortable seats ever. Having flown Business with Cathay, BA, Korean and others, Qatar is our number one airline. Small upper deck economy seating on A380, aisle seat in center 4, generally same legroom and comfort as lower deck but a little quieter, no specific obstruction under seat foot area. Possibly suggest opting for one of 2 x 2 seats on sides of this zone as better option. Flight from MEL to Doha. 48F and G are back against a bulkhead. Reasonable layback and by the toilets. Good entertainment system. However, A380 seats are so hard and unconfortable like all A380s. For an aircraft capable of 15 hour legs how can that be? After 2 hours the pain in my bum sets in, after 15 hours its excruciating. The next leg was on a B777-300. No problem. On my next A380 flight I am taking a whoopee cushion. Great service from cabin crew and food quite good too. I found 42A a great option. It has about 20-25 centimetres of extra room between the seat and the window which is great for storing blankets, pillows and other things. The seat's location behind the stairwell also makes it a bit quieter as it helps to block some of the noise from other parts of the cabin. Given that it is not en route to any toilets or galleys which cuts down on foot traffic. The seats are comfortable and there is good spacing. Plane is quiet and spacious. IFE is new and quite impressive for both its UI and content. Only negative was its proximity to the bassinets in row 43, but the positives of this are more than make up for this drawback. Flew on the A380 on our DOH-BKK leg (after the awful 788 from LHR) and it seemed blissful! Everywhere seems really spacious and the the flight was empty, and so this front cabin is great. IFE is very good, toilets are nice, seats have a good pitch, width and recline and it is such a quiet plane! Warning, if you like sleeping against the window then don't go for the first few seats in this cabin as there is a sizeable gap between the seat and the wall. The best seat one could want in economy class. The seat in front is missing allowing you to stretch your legs as much as you want. Only drawback is the tray-table and IFE is stowed in the side of the seat. The business class lounge is located on the other side of this bulkhead with their lights constantly on (and quite bright). The air hosts constantly walk between this lounge and the economy section throughout the flight. This meant you are constantly woken up by the light from the business class lounge and the noise of staff trying to unlock and lock the rope and curtain that blocks off this section. Would not recommend sitting here. Seat 41K is a very good seat. Because up until row 44, the stairs block out the other passengers making the little area of 9 seats very excluded from the rest of the cabin which is good. The seat is spacious and the window is aligned perfectly. As you are at the front, you get served your meal first as well. However, there is storage for the cabin crew in the stairwell and the door was quite hard to close and was being slammed for the duration of the flight which was a little disturbing. The IFE screen is massive and the touchscreen is very responsive. You also get to exit first from the aircraft. However, none of QR's seats have footrests like EK and SQ. Great, comfortable seat! Good seat, extra bonus of having a little extra storage under the window. Due to overbooking I received an operational upgrade from Business to First. I guess because my business class seat on the inbound 787 earlier that day was already quite overwhelming I did not fully appreciate this great seat in First at that time. The amount of personal space is very impressive as is the meal service (Oscietra caviar for starters!). Although it was only a 5,5 hour flight I managed to get some sleep. I have two A380 trips in business coming up shortly that I can look forward to. Seat comfort was on par with other A380 economy seats. Service was good but food was subpar. Excellent seat, lots of legroom which made it so much more comfortable. It is also much quieter upstairs as there are fewer passengers. Only downside was a few people used it as a through way, otherwise a great seat. You also exit the plane with the business and first class passengers, so much quicker. Generally we were very disappointed with Qatar's A380. The seat pitch seemed very poor for other A380's we have been on. Maybe that is why they could offer such a good price. Also, it seemed to be a noisier aircraft (engine noise). We won't be flying Qatar A380 again unless we can guarantee more legroom. Not only is the seat really good. The service is nearly out of this World. I have had seats in economy and business. Compared to many other Airlines, it is good seats and Again, really nice service. Service was excellent.Food serving was beautiful. This aircraft arrive to destination bit earlier than schedule. Comfortable seats in the middle suitable for couples. Quiet and able to have a normal conversation without shouting. The airvents were a welcome sight after our middle seats on the 787. Good seat. Plenty of room, full recline. Great seat. Additional legroom and storage. 10 E/F essentially are next to the toilet door on each side, which makes for noise and congestion. I travelled from Doha to London in QR01 on an Airbus 380. Seat 25B is a nice seat, you have ample leg room as this is the first seat after the door from Business Class to Economy Class. The door remains closed most of the time. Recommended. The A380 Economy Class is truly an amazing experience. There is so much leg room, the entertainment system was jam packed full of videos, games etc. and the cabin crew were amazing!. The seat itself was extremely comfortable. Never had such an amazing flight. Would recommend to fly with Qatar Airways A380! Business class, DOH to LHR. Super comfortable fully flat seat, and loads of personal space with good storage, including personal bin at seat level. Personal screen was great, excellent large table for dining/work and positioning enabled you t get outof your seat even with a full meal on the table. Only criticisms are that I felt the food choice was a bit limited for what was scheduled as a 7.5 hour flight, and we were unable to use the onboard lounge as it was colonised for most of the flight by some rowdy and quite unpleasant fellow passengers. The final leg of a longer journey from Chennai - Doha  Heathrow. 31A is the very last row on the top deck in the small economy class section behind business class. By some distance the best flight we have ever taken! This section is reserved for Qatar's Privilege Club members and now I know why; up there instead of 3-4-3 seating, its 2-4-2 due to the curvature of the plane and the experience was great. No-one else next to us, comfortable seats, LOADS of legroom, big HD quality IFE screens, fantastic service from 2 dedicated cabin crew and 2 toilets for just 8 rows of seats, storage box next to the window, complimentary mini amenity kit for all economy passengers and of course that great feeling of walking up the stairs inside the plane to reach our seats! The fact that its such a small section of economy makes it feel pretty exclusive too  we were in economy but it felt like wed been upgraded! Even though it's the last row, contrary to what SeatGuru says, there was full recline on the seats and the galley and toilets really weren't a problem for this daytime flight. Top notch and well done to Qatar for treating economy customers so well. 5* service! 22k has no problem being 1 seat closer to the toilet. Qatar has installed very heavy curtains to dampen noise. If you plan to make good use of the onboard lounge then 22K is ideal. If you want to sleep you should go further forwards. Qatar Airways flies 1 versions of Airbus A380.